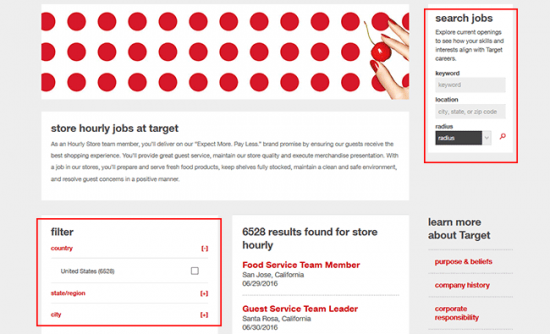 The Target job application can be completed online or in-store. The application requires various information from the applicant such as their legal name, date of birth, employment/education history, etc. The applicant may apply for any number of positions including cashier, cart attendant, supervisory positions, management, district management, as well as specialized positions. Follow the instructions posted below to learn how to navigate the Target website and fill out an online application. 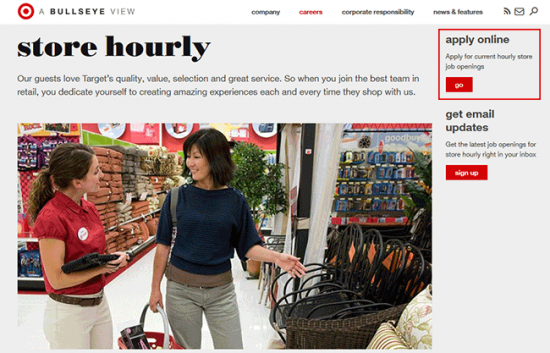 Step 1 – Go to the Target careers website. Press the “Go” button (outlined in the screenshot) to search for available jobs in your area. 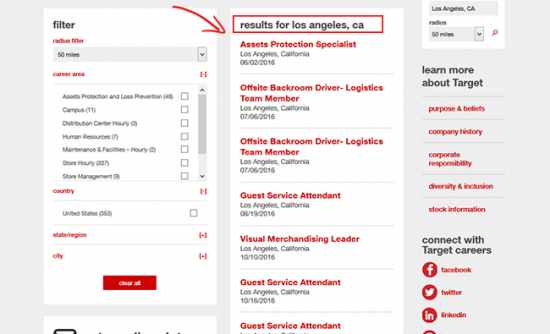 Step 2 – Filter available job openings by using the “Filter” tool OR search by city/state/ZIP via the search tool (both options outlined in red below). Step 3 – Click the job that you are interested in applying for (displayed in the “results” window). Step 4 – After reviewing the job information, click the “Apply Now” link to go to the main application form. 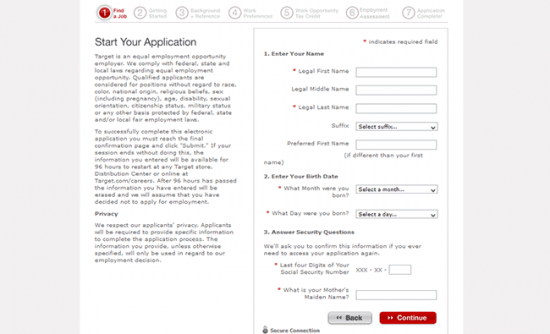 Step 5 – The online application consists of seven sections. Each section must be completed before you will be able to move on to the next one. Press the “Start” button to begin the application process. Note: Different positions may have varying application requirements. Step 7 – Once the application has been completed and submitted to the selected stores, the applicant should expect to hear from a member of the management team for an interview (or further instructions). 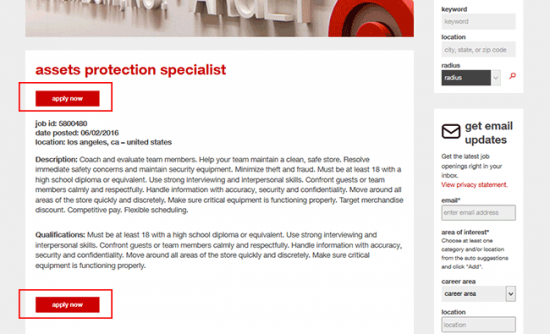 Step 1 – Download the Target Job Application. 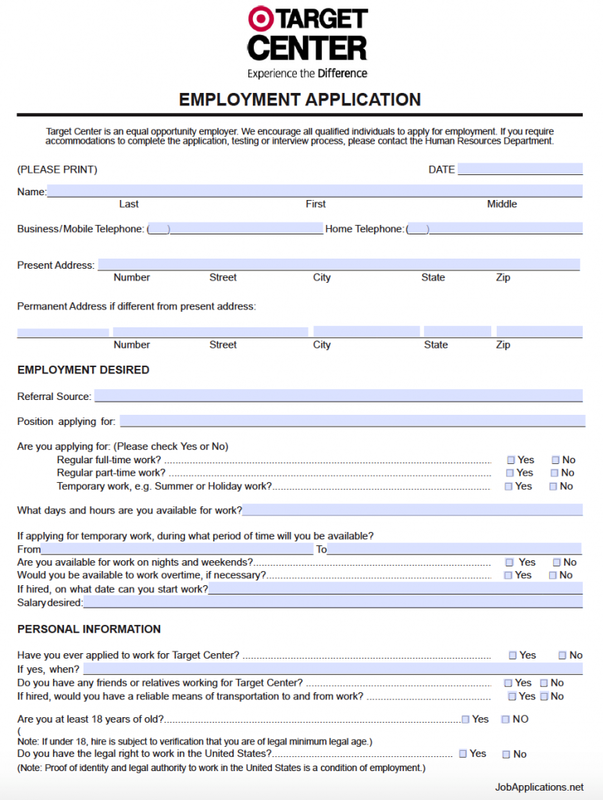 If application is for temporary positions, enter the time period, From and To of availability. Enter the date the applicant may begin working, if hired.